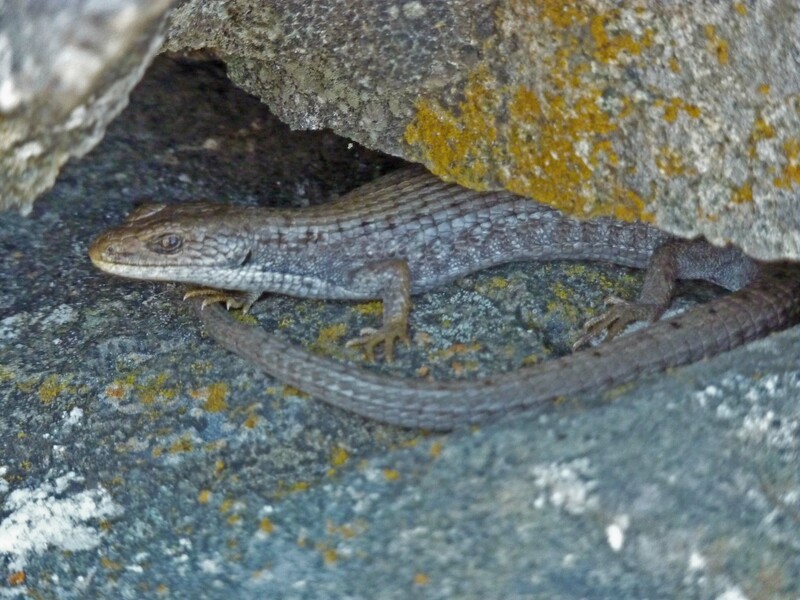 If you live on Triangle Mountain in Metchosin, the Saanich Peninsula, Mill Bay, and Denman Island, you likely are familiar with European Wall Lizards (Podarcis muralis). These lizards certainly seem to be getting around thanks to our help. While I was away on parental leave in 2013, I received Google-Earth images of a specific intersection in Nanaimo, along with photos of Wall Lizards from the area. Obviously this invasive lizard also has found its way to the “harbour city”. Wall Lizards do well in disturbed habitat and so should populate Nanaimo’s urban areas. 1a – large and small body scales; no distinct stripes; body copper, grey-brown, or green and copper, or green and black; tail same colour as rest of body – go to 2. Here are some pictures to help ID local lizards. 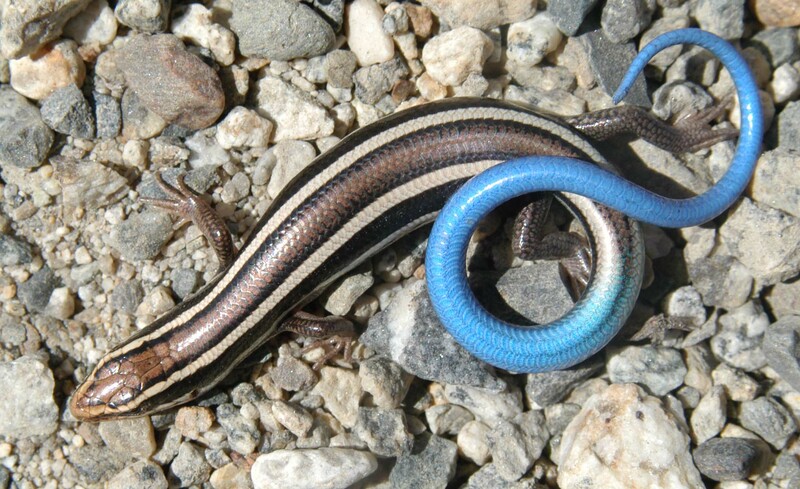 Western Skink from near Osoyoos. 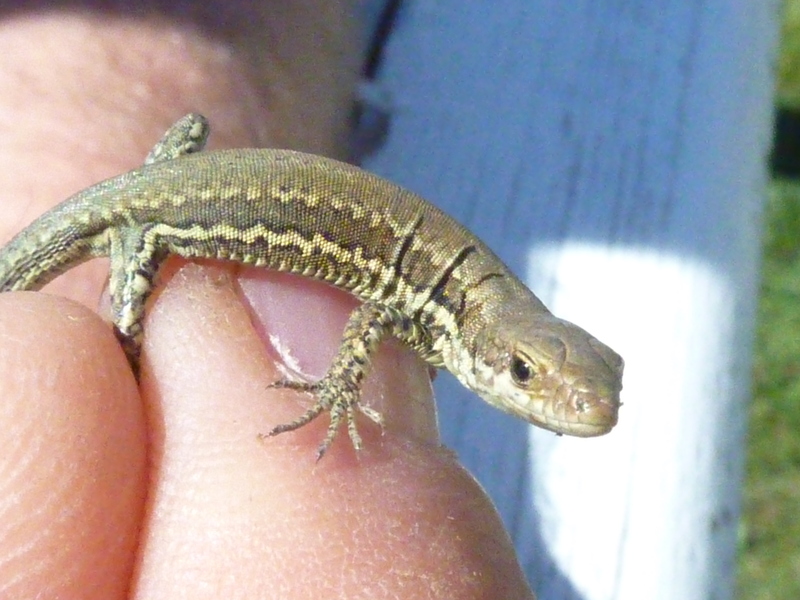 Northern Alligator Lizard from Devonian Beach. 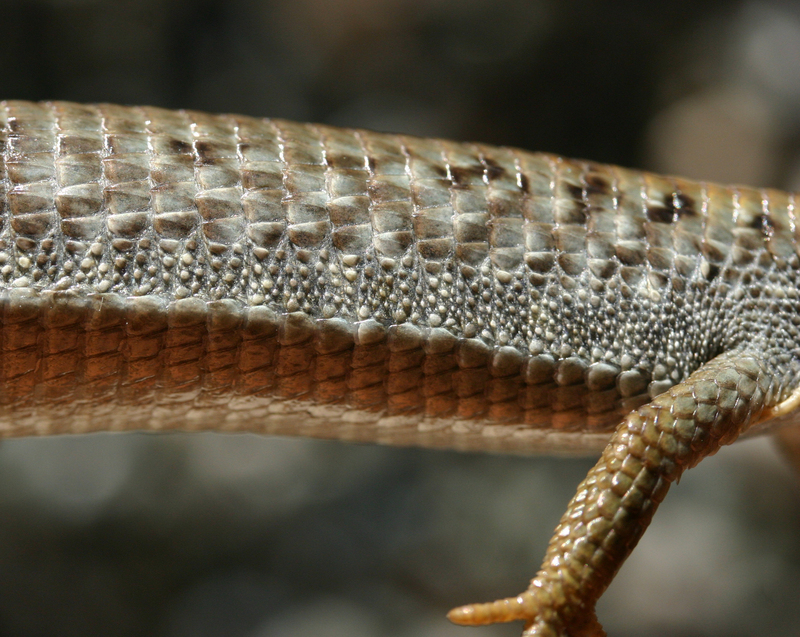 The flank of a Northern Alligator Lizard showing large scales on the belly and back, and only a narrow mid-lateral band of small scales. A young Wall Lizard from Saanich. A male (left) and female (right) Wall Lizard from Saanich. Wall Lizards sometimes bury eggs in soil in plant pots, and when the plant is purchased and moved, the lizards go with it. Wall Lizard eggs are roughly the size and shape of a TicTac candy – so they are easily overlooked. Some lizards are transported as contaminants in hay shipments and in livestock trailers, and occasionally, these lizards are intentionally transported and released. Accidents happen, but intentionally releasing exotic animals – that is illegal. A male Wall Lizard on a windowsill. Yes Wall Lizards are cute and would make charming additions to a garden, but they are originally from Italy. Around 1970, 12 or so Wall Lizards were released in Saanich. From that small population, we now have thousands of lizards and there is no sign their population growth is slowing. There are occasional reports of Wall Lizards in Victoria, with the southern-most established population in the city in the green-space behind Commerce Circle (the Vanalman Avenue area). Individual lizards have been found in the Fairfield area, and I have heard of a few lizards just west of Hillside Mall. So far I have not seen any evidence that these populations became established. [This is dated information – we now know that there are Wall Lizards well-established in the south near the Oak bay Recreational Center, around Moss Rocks Park in Fairfield, and just west of Hillside Mall]. Have you seen European Wall Lizards? 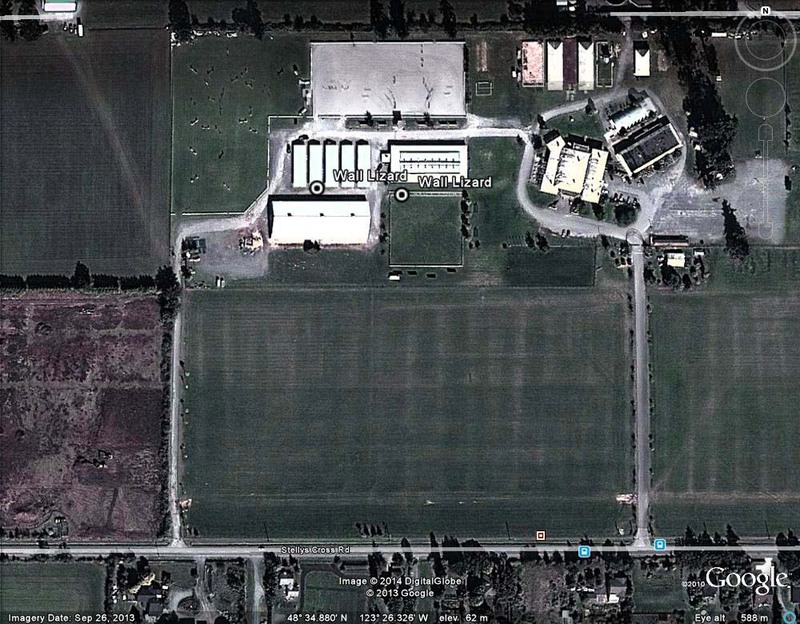 Here is an example of a Google-Earth image showing where I found Wall Lizards in 2012 while at the Saanich Fair. One of the youngling Wall Lizards I caught at the Saanich Fair. This tiny lizard was one of the two I caught along the rock-wall at the Saanich Fair, September 1, 2012; I was not able to get my hands on the one near the stables. This lizard will join others in the museum collection, but has yet to be catalogued.